We love broccoli over here and we're always looking for ways to jazz it up. Broccoli by itself is pretty awesome, but when it's paired with other ingredients, it can be taken to new levels of excitement. While I was searching through my cabinet for the perfect accompaniment to the little green trees, I came across a can of beans. Hmm...beans and broccoli? It sounded interesting so I went for it. I decided to combine them into a casserole with a few other full flavor items and top the whole thing with crispy breadcrumbs. 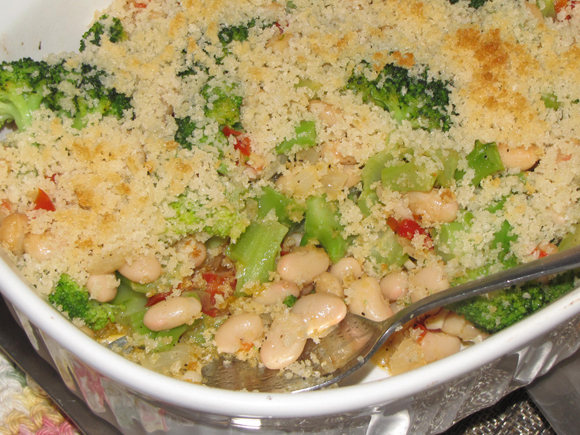 It was a nice change of pace to the usual veggie side dish and it has the bonus of 'good-for-you' beans on top of the vitamin rich broccoli. Because of the ingredients used, this is definitely one healthy, veggie-packed dish! I used frozen broccoli because that's what I had on hand, but you could use fresh as well. Just make sure you cook it first or you'll have a nasty, warm, raw broccoli casserole! 2. In a large skillet, saute onion and red pepper in oil and 1 TB butter until soft. 4. Stir in beans and broccoli gently until mixed well. Season with salt and pepper. 5. Grease a 1 1/2 - 2 qt casserole dish and pour in broccoli mixture. 6. Melt 1 TB butter in microwave and mix with breadcrumbs. Sprinkle over broccoli and bean mixture. 7. Bake for 10-12 minutes or until breadcrumbs are golden brown.